Online multiplayer no longer works due to the GameSpy servers being shut down. Small online community on Discord and GameRanger. Includes 'Winter of the Wolf' expansion. The latest version of the game is also the expansion - Winter Of The Wolf (1.50q). The latest non-expansion version is 1.50g. Patches for the non-expansion game are available. The page falsely states there is a 1.50q (Winter Of The Wolf) patch while it's the 1.50g patch for the original game. Click Edit from a bar and choose Add. Type in a name for the game. Click ... right of the Path input box. 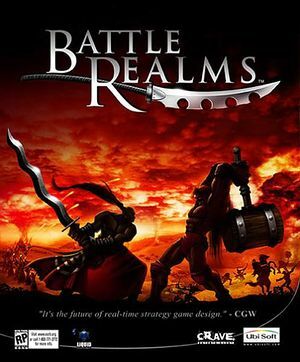 Go to the installation folder and choose Battle_Realms_F.exe. 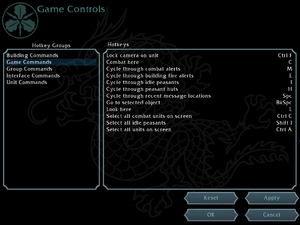 In position panel, type in the game's resolution (e.g. W 1024 H 768). Go to Video tab and check check Hide multi-monitor config (leave the rest of fields unchecked). In Cursor visibility panel choose Hide. In Cursor handling panel choose Correct mouse position and Force cursor clipping. Click OK, minimize DXWnd and run the game. Available via the in-game custom profile menu (not settings). Scroll speed is responsible for the screen navigation sensivity. The addon WotW is not localized. Fixes most of the videocard-related issues. Use the resolution native to your monitor. Allows capturing Battle Realms with OBS. Eliminates most of the issues. Prevents from playing online by making the game unable to synchronize progress. Download the latest version of dgVoodoo2. Copy the files in the MS folder and place them in <path-to-game>. From the window which appears, navigate to <path-to-game> and click Select Folder. Select the folder you just added from the dropdown list under Config folder/Running instance. 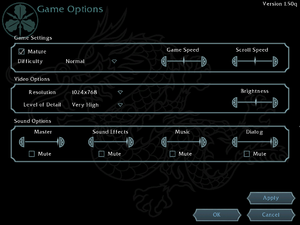 Under Full Screen Output, choose which monitor you want the game to be displayed on from the dropdown list. For example, if you want your primary monitor, choose \\.\DISPLAY1; if you want your tertiary monitor, choose \\.\DISPLAY3. Click the Apply button, then click OK. When on desktop, press ⊞ Win+P. can use the 4GB patch. This page was last edited on 14 March 2019, at 13:26.